The region has a more favorable view of Trump than the nation as a whole. 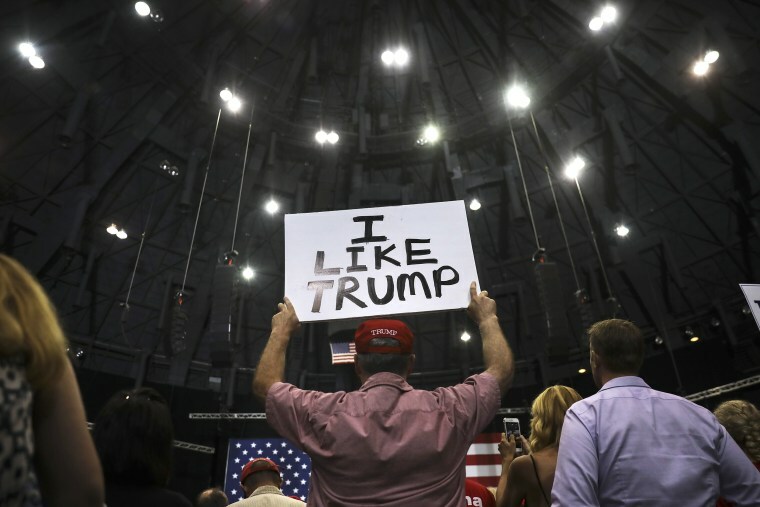 Voters in the South are more inclined to support a Republican for Congress and have a favorable view of President Donald Trump than the nation as a whole, according to new NBC News|SurveyMonkey online polls. Across the South, 48 percent would vote for GOP candidates if the midterm election were held today, compared with 43 who would support Democrats. (The states polled include: Alabama, Arkansas, Florida, Georgia, Louisiana, Mississippi, North Carolina, South Carolina, Tennessee, Texas and Virginia.) Nationally, by contrast, 49 percent of voters would vote for a Democratic candidate, compared with 42 percent who would vote for a Republican. In three of the states surveyed — Alabama, Mississippi and Tennessee — a majority or a near majority of voters said they would vote for a Republican congressional candidate over a Democratic candidate (The numbers were 55 percent of voters in Alabama, 51 percent in Mississippi and 50 percent in Tennessee.) Trump won all three states overwhelmingly in 2016. Trump still enjoys majority support in the region, like he did in the 2016 presidential election, with 52 percent of Southern voters approving of his job performance, compared with 49 percent who disapprove. Nationally, 54 percent of voters disapprove of Trump. In three states polled, more than half approve of the president's job performance, such as Mississippi (52 percent), Tennessee (53 percent) and Alabama (59 percent). However, voters polled in Georgia, where the president won 51 percent of the vote in the 2016 election, 54 percent of voters disapprove of his job performance. Voters in the region have also soured on Congress. Seven in 10 voters in the South disapprove of the way Congress is doing its job. Nationally, 74 percent of voters disapprove of the legislative branch. When it comes to the economy, roughly 7 in 10 Southern voters, or 71 percent, rate the national economy as good compared to 69 percent of national voters. Southern voters also have a more positive view than Americans overall about their state's economy. Roughly 7 in 10, or 72 percent, of Southern voters rated their economy as good compared to 66 percent nationally. Of the four Southern states polled, majorities in Georgia (80 percent), Tennessee (78 percent), Alabama (71 percent) and half of the voters in Mississippi rated their state's economy as good. Southerners also have a dismal view of the current state of race relations. Only 14 percent of Southerners think race relations in their state are improving. Forty-four percent think race relations in their state are getting worse. Meanwhile, a strong majority of Southerners — 61 percent — oppose removing Confederate monuments and statues from public spaces. That number is higher in some Deep South states, with 68 percent of Alabamians and 65 percent of Mississippians opposing removal, for instance. The NBC News|SurveyMonkey polls were conducted Sept. 9-24, 2018, among a national sample of 8,898 registered voters (+/- 1.4), a regional sample of 2,655 registered voters who live in AL, AR, FL, GA, LA, MS, NC, SC, TN, TX and VA (+/- 2.8), a sample of 985 registered voters who live in MS (+/-4.3), a sample of 1,254 registered voters who live in AL (+/-3.8), a sample of 1,955 registered voters who live in GA (+/-3.0), and a sample of 1,609 registered voters who live in TN (+/-3.3). Respondents for the nonprobability surveys were selected from the nearly three million people who take surveys on the SurveyMonkey platform each day. For full results and methodology, click here.